We recently spent three months living on the Indonesian island of Bali. 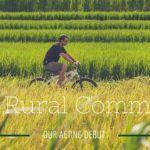 Because of the nature of the work we were undertaking whilst there, we were able to travel to parts of Bali we had not visited before. Furthermore, staying there for an extended period afforded us the chance to experience other aspects of the island. When we weren’t travelling, our base on Bali was the resort town of Sanur in the south of the island. Sanur is pretty quiet, indeed its local nickname is ‘Snore’ (*), but this suited us just fine. Our apartment was 10 minutes’ walk from the beach; we were relatively close to the offices of the company we were consulting for; we had local restaurants on our doorstep and, best of all, it was quiet! 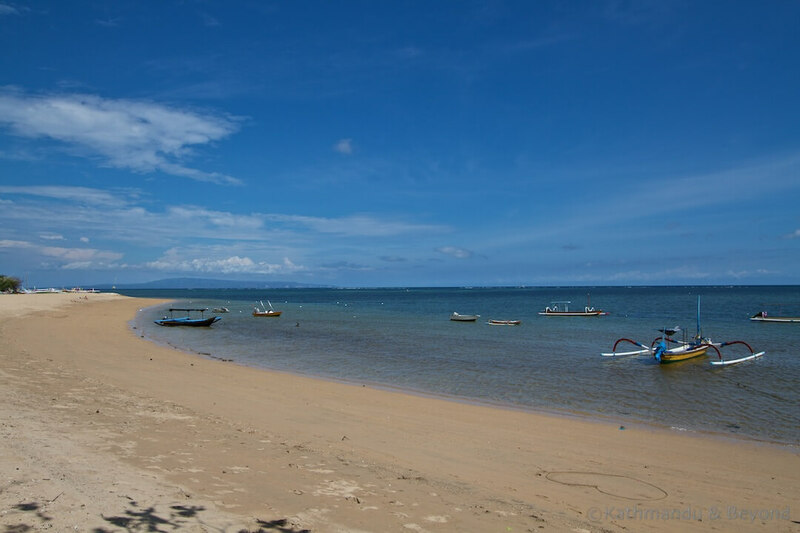 (*) Although it is common knowledge that Sanur earned its nickname because it is rather quiet, it may also be down to the correct pronunciation of the spelling – sah-noor? We had a nice two-bed apartment on the top floor that was only slightly marred by sketchy internet connection and the fact that the guy next door had decided to build a bloody great big concrete wall right opposite our balcony, blocking both the view and the natural light. We never got to meet him but what a nice, considerate guy he must have been! If we weren’t at our laptops, we would go to the beach for a swim, walk (and often jog) along the very pleasant beachside promenade or go for a massage. Six o’ clock for us was sundowner time and this involved yet another trip to the beach, where we would sit in our favourite beach shack and drink cold bintang beer for an hour or so before heading out for dinner. When we arrived in Bali in mid-September, Titie, the owner of the shack had just got two puppies (Blackie (pictured) and Lucky) so over the next three months we watched them grow up and they kept us amused with their playful antics. In terms of distance, Sanur is only 13km from Kuta (best described as Australia’s Benidorm), but it is a world away in every other sense and if you are of a certain age and looking for a relaxed place to hang up your backpack for a month, or more, then Sanur would be a good place to do it. Located in the northwest of the island, close to the ferry terminal for Java, Bali’s only national park is worth visiting. The park is not that easy to get to (we visited using private transport) and the accommodation options are limited to either basic guesthouses or relatively high-end resorts but for a healthy dose of savanna and mangrove swamp as well as some of the island’s best diving (Pulau Menjangan), it doesn’t get much better than West Bali National Park. I don’t have the same obsession with rice terraces as Kirsty does but I do like them nonetheless and furthermore, unless you go around with your eyes closed, they are pretty difficult to avoid in Bali. 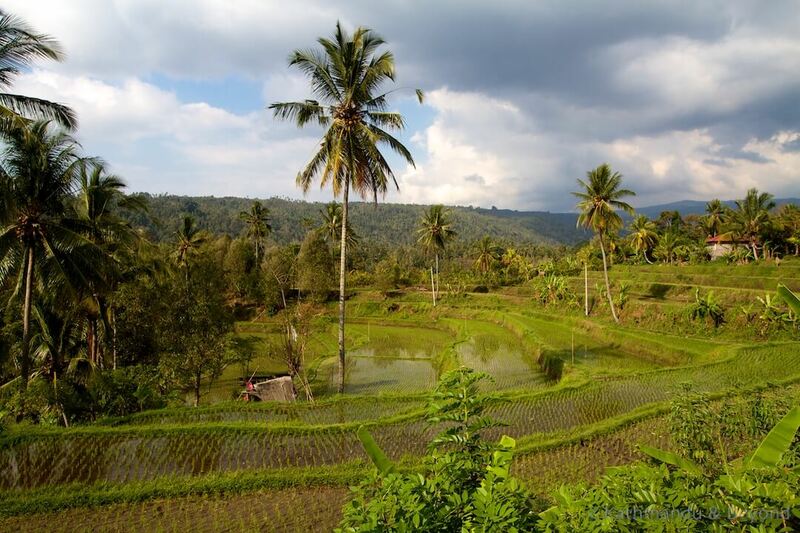 I’ve added a few rice paddy shots to this blog but for the serious stuff refer to Kirsty’s Jatiluwih Rice Terraces post. Clearly visible from our regular beach shack in Sanur, the island of Lembongan has a split personality. From about 11am, when the day-trippers from mainland Bali arrive until 3pm when they leave, Lembongan is a pretty busy place with lots of noisy tourists splashing around in the sea, inflatable banana boats bouncing around, and even the odd parasailer overhead. But in-between these times the island is once again quiet and extremely peaceful and there is little wonder some call it the ‘Bali of yesteryear’. 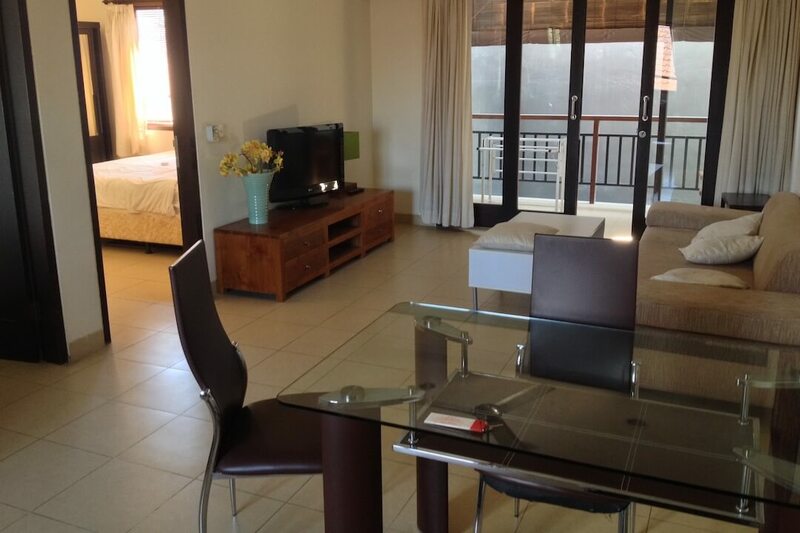 If you’ve got the budget, beachfront accommodation on Mushroom Bay is the place to stay but back in the interior there are also plenty of good budget options that are only a short walk from the beach. 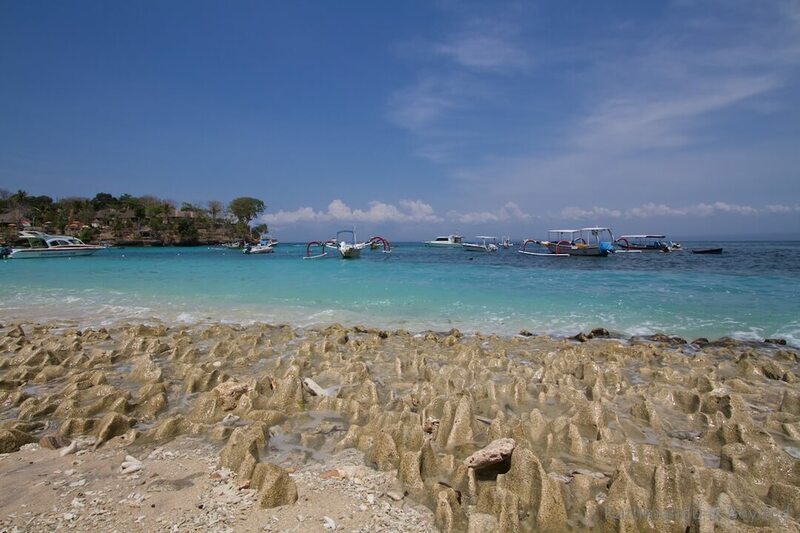 To really appreciate Nusa Lembongan, our recommendation would be to spend a night or two on the island rather than just visit as part of a day trip. Lovina, on the north coast of the island, may not have the best beach in Bali (that honour must surely go to Sanur and I guess Kuta?) but it does have a relaxed vibe and spectacular sunsets(*). 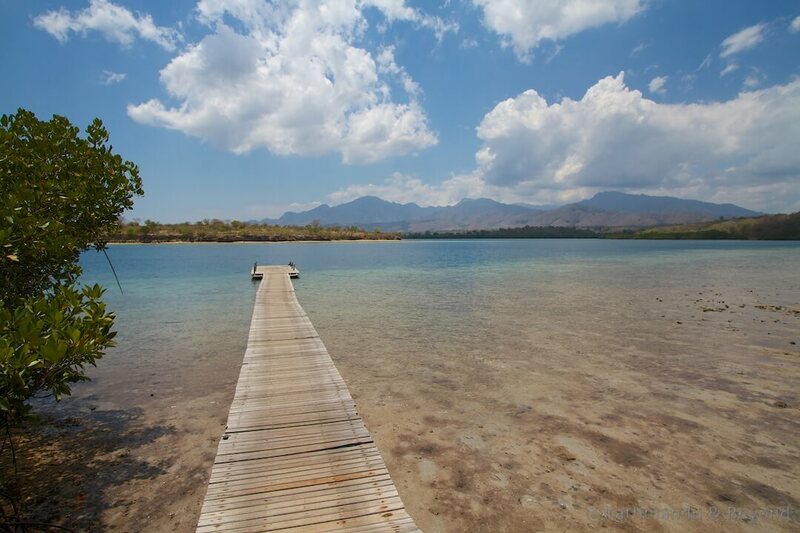 Lovina makes a nice alternative to the resort towns in the busier south of the island and we would consider it for a long term stay if we were to return at some point in the future. 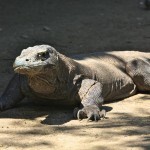 (*) Again, Kuta has this as well – if only you could remove the tourists, congestion and pain-in-the-arse touts, eh? 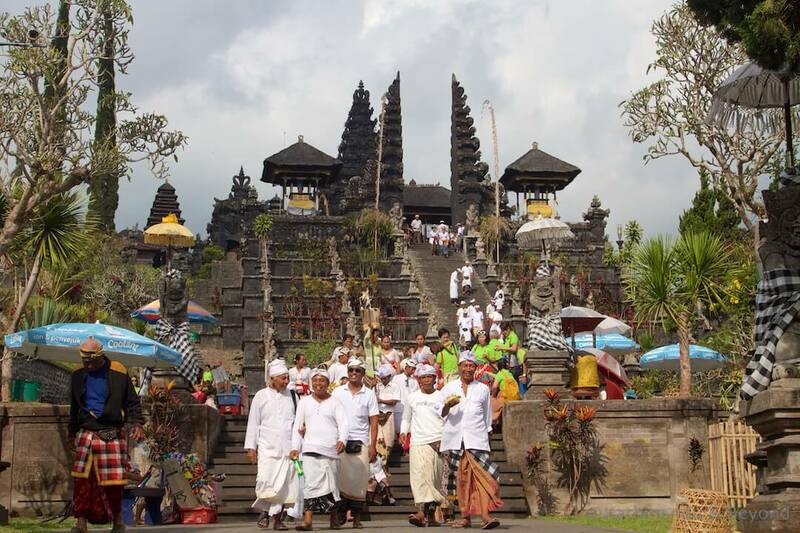 Two barbaric terrorist bombings (2002 and 2005) and one tsunami (2004) has ensured that many Balinese, particularly those associated with the tourism industry, are nowadays extremely grateful for income generated from tourism. As a result they go out of their way to ensure that you, the tourist, is made to feel very welcome on their island. 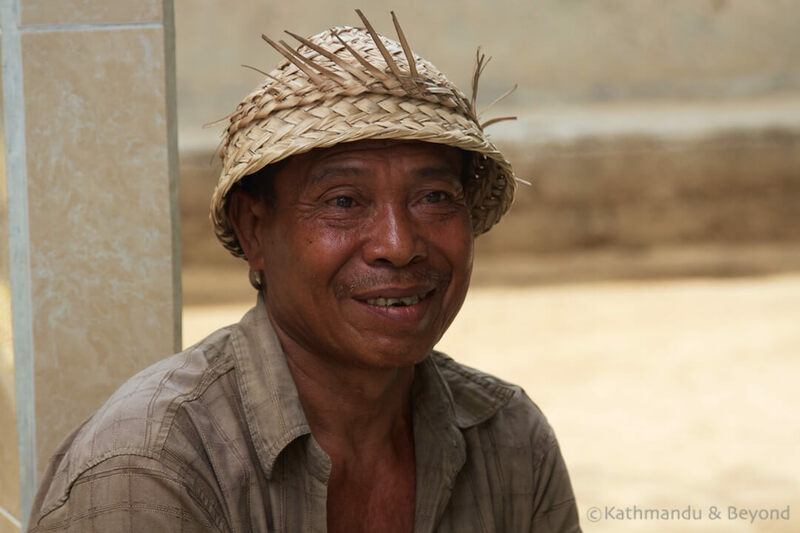 Personally, I think the Balinese would be warm, witty and charming regardless but so many lost their means of bringing in an income during down periods after the above events and they want to do their best to make sure this doesn’t happen again. It’s not to say that the islanders are perfect – there are annoying touts, particularly in Kuta, and the traffic police are constantly extracting bribes from unwitting tourists on motorbikes, and there is of course the selfish individual who built the brick wall right next to our balcony – but on the whole the islanders are very nice. 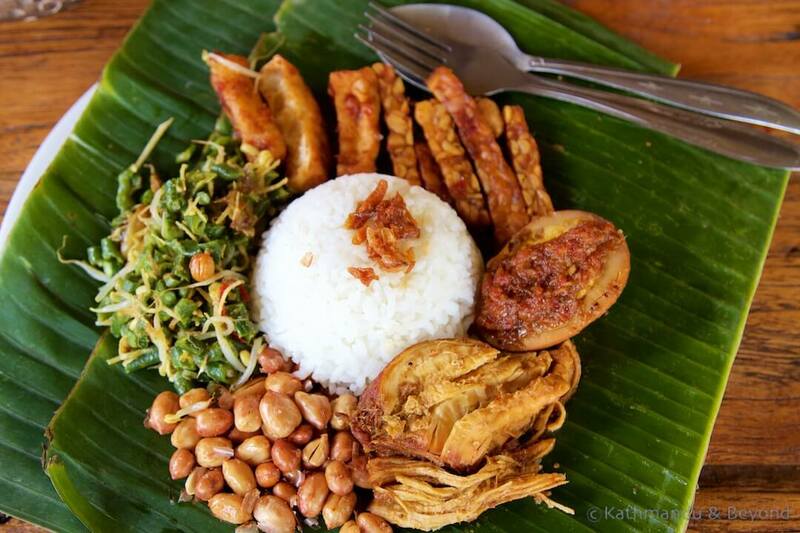 On previous trips to Indonesia we didn’t remember the food being particularly appealing but then we worked out that on these previous visits we hadn’t in fact spent that much time on Bali. We were therefore pleasantly surprised at how good the food was during this visit. 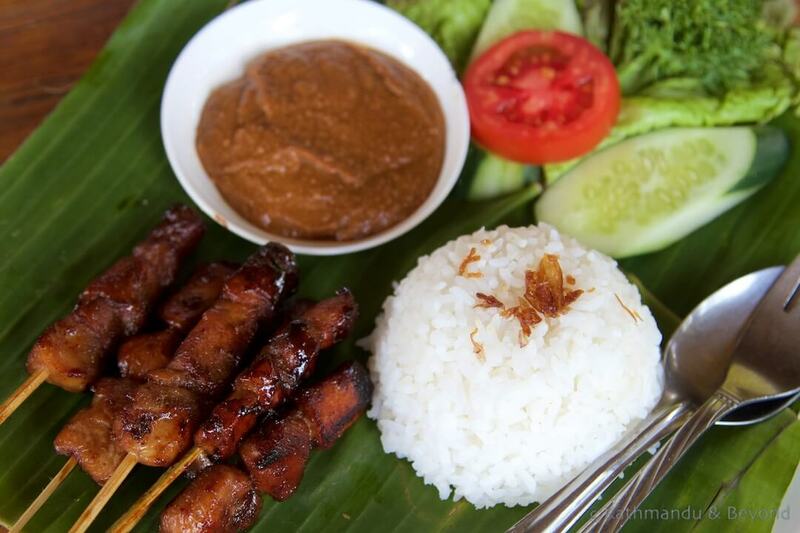 We of course ate plenty of fresh seafood but also enjoyed Nasi campur (*), skewers of satay and Babi guling (roasted suckling pig). I would have eaten the latter every other night but Kirsty did the right thing and limited me to once a month at most due to its artery-clogging properties! (*) Basically the meal of the day which includes rice, vegetables and either fish or meat. We were also invited for a home-cooked meal which was definitely the best of all – thank you Liza and Andreas! 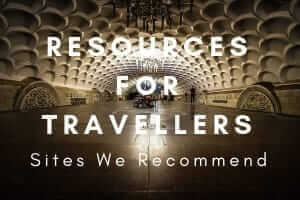 As freelancers, we weren’t technically members of staff but the company for whom we consulted for was very welcoming and, if we weren’t away from Bali, Kirsty and I were invited on weekend day trips organised by the staff. 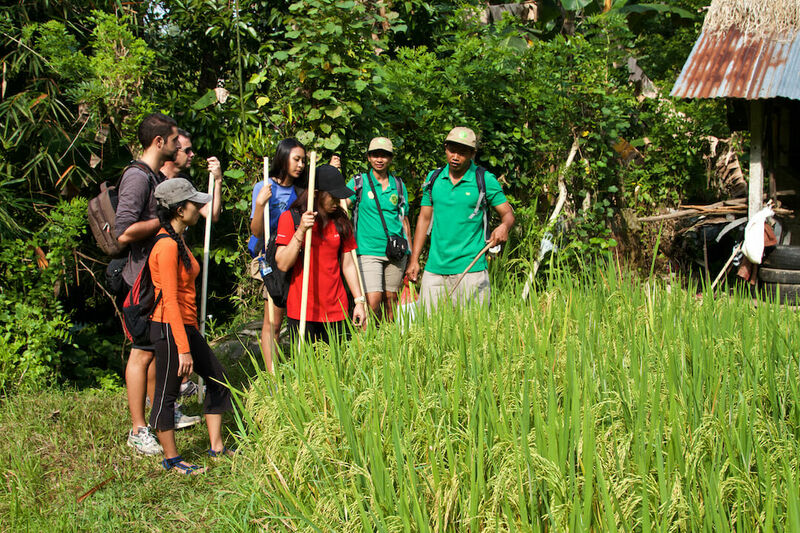 These excursions normally involved a hike for a couple of hours or so through some wonderful Balinese countryside followed by a big lunch and a chance to get to know the guys we were working with. We appreciated the invites and the chance to get away from Sanur every now and then. You were in the wrong job mate! Thank you Ryan, glad you enjoyed it. I’m with you, Sanur is just right if you are of a ‘certain age’. Could you ever imagine living for an extended period in Kuta – I would go insane after about three days! Enjoy Bali when you head back again. If you get a chance then check out Lovina. 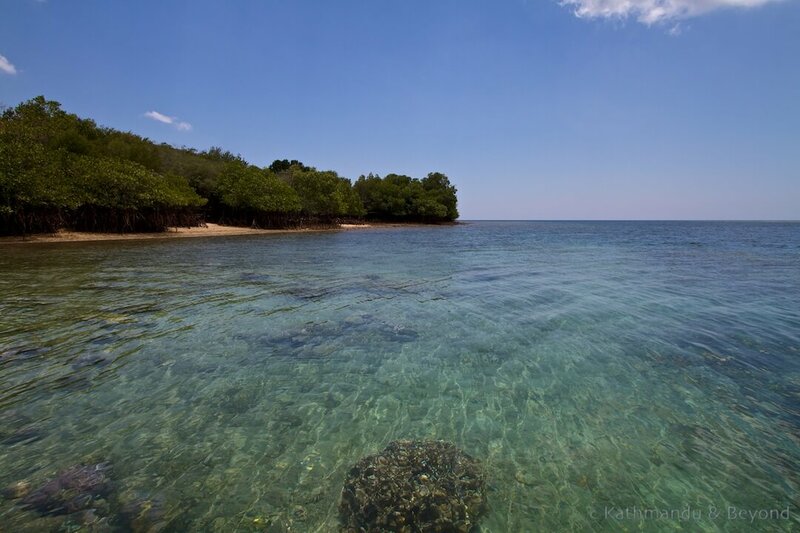 If you are a fan of Sanur you may also find Lovina appealing and a change of scene?